When Dr. Maravene Loeschke passed away on June 25 last summer, the University System of Maryland lost one of its best and most beloved university presidents. Chosen to succeed Dr. Robert Caret in 2012, President Loeschke’s tenure as the head of Towson University was cut short by cancer after only three years in office. Although her presidency was brief, her time at Towson covered 38 years and her impact on the University was significant. Her long-time connection to Towson began when she enrolled as a student in 1965. A native of Parkville in Baltimore County, she commuted to campus each day, graduating with a BA in theater in 1969. Although her intent was to pursue a career in acting, her plans abruptly changed when she was persuaded to remain at Towson to fill a temporary faculty position. That temporary position eventually grew into a life-long commitment to higher education as a teacher, writer, actor, and dedicated administrator. Along the way she completed a Master’s degree in 1971 and a Ph.D. in 1976. A natural teacher, Maravene was popular with her colleagues and students even though she was demanding. She insisted that students work hard and make no compromises in pursuing their academic goals. So firm was she in requiring students to be prepared and be on time that one student who arrived late for a class brought a Maryland state trooper with her to testify that she was delayed in getting to campus because of an accident on the beltway. Because of the high regard that faculty members and administrators had for Dr. Loeschke, it was no surprise that she rose steadily through the University from instructor to professor, from department chairperson to Dean of the College of Fine Arts and Communication, and eventually to the presidency. No matter what the position, Maravene left a strong impression. She was one of the key members of faculty who helped the Theatre Department earn recognition for the quality of its students, such as John Glover and Rock Dutton, who went on to success on Broadway, TV, and Film. Likewise as a dean, she was instrumental in planning and designing the expansion of the Center for the Arts building. Through it all she continued to maintain her commitment to the arts by publishing books on theater. She wrote a well-regarded book on the art of mime, a tribute to the women who created and shaped community theaters in Baltimore, and wrote a book on Emily Dickinson. In 2002 she was recruited to become the Provost at Wilkes University in Pennsylvania. During her tenure there, she became an advocate for women’s leadership in higher education and for focusing the university’s attention on student development. After six years at Wilkes, she was selected to become the president of Mansfield University, a small public university in northern Pennsylvania. She led that institution through the tough times of the Recession, even eliminating the football program in order to save funding for the academic program. 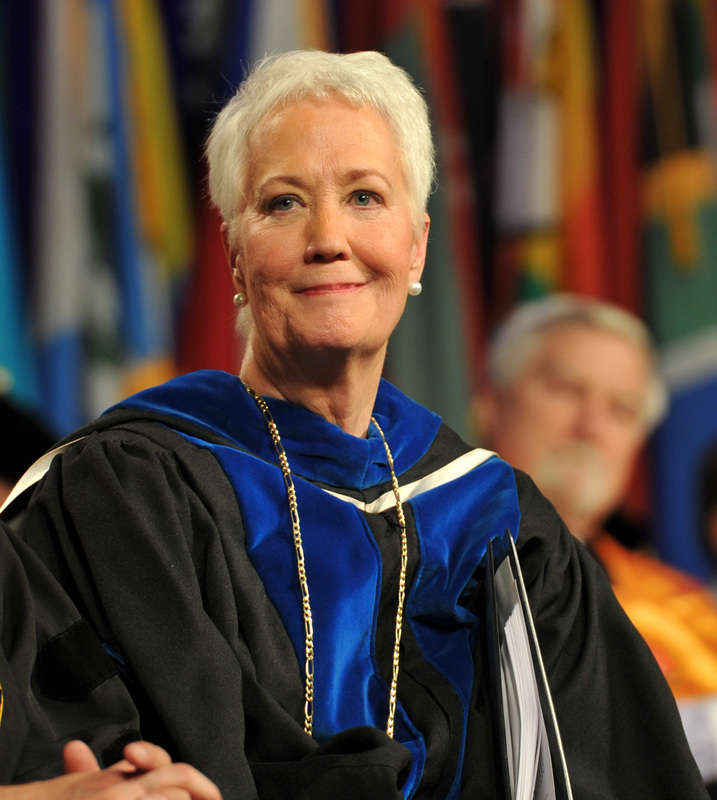 At the end of 2012, she was selected to become the 13th president of Towson University. Maravene Loeschke’s return to Towson in 2012 came at a most appropriate time, both for her and for the University. As former Chancellor Britt Kirwan said at the time, “Clearly Dr. Loeschke brings a philosophical alignment with the USM goals of closing student achievement gaps, increasing the number of young people in Maryland with college degrees, and responding to the state’s work force, and economic development needs.” Picking up where Dr. Caret left off, Maravene continued the expansion of the University into the town center of nearby Towson as well as opening the new satellite campus in Harford County. Enrollment continued to grow, reaching nearly 23,000 students, and offering over 100 undergraduate degrees and nearly 50 graduate degrees. She quickly established a student-centric administration with an open door to listen to the needs of the students. She created a new Leadership in Education program, and opened the new SECU Arena for sports. And although her plans for Towson’s future were cut short, she left her imprint on this period of the University. This entry was posted in Education, People/Places. Bookmark the permalink.